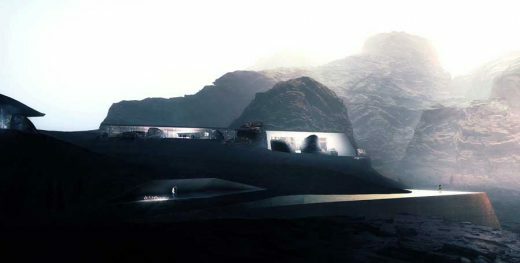 International “green” architect Chad Oppenheim sets a new benchmark for design and ecological sensitivity with the Wadi Resort—located in Wadi Rum, Jordan, set for completion in 2014. 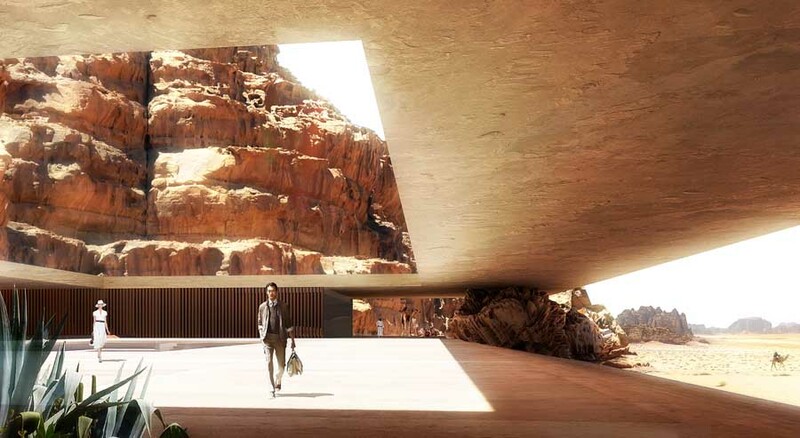 Oppenheim Architecture + Design (OAD) beat out a global competition and will execute an unprecedented project comprised of 47 desert lodges, setting forth a future primitive experience for the avid globetrotter, an hour and a half outside of Petra, the ancient city of the Nebataeans carved into the desert rock. Oppenheim’s winning proposal set out to reinterpret the way society deals with surrounding nature by taking full advantage of the mystical valley where desert sand meets desert stone. The project merges silently with its wondrous setting, exploiting and enhancing the natural beauty of the desert to establish accommodations that are uniquely elemental and luxurious. Dramatically situated, the lodges and villas in their various incarnations; are all about a visceral connection to culture and place. The resulting experience is a revolutionary notion of opulence that is intentionally reduced to what is essential. The structure of the lodges will be carved into the sandstone cliffs, utilizing the existing geological geometries of the rock to devise the form. Other structures are comprised of rammed earth and cement mixed with the local red sand. The minimal yet powerful gestures of the architecture, both built and carved serves to create harmony, and balance while framing and amplifying the surroundings. The interior and exterior are deliberately blurred establishing maximum impact with minimum effort. Inspired by the primordial, Oppenheim used his expertise in sustainable design to create passive means of cross ventilation, taking full advantage of the natural cooling effect of the rocks, and proper positioning allowing the project to minimize energy consumption and maximize comfortable healthy living. “We have trained and heightened our senses to see, smell, taste, hear, and touch the mystical beauty of Wadi Rum. We tapped the inherent power of the desert through primal and instinctual design moves, informed by the forces, rhythms and patterns of nature— past, present, and future,” says Oppenheim about his creative process for the project. The strategies employed are those that have been proven over the last thousands of years. We have learned a great deal from the civilizations that have lived in the beautiful and magical desert for millennia. Great care has been given to utilizing local materials as well as various water conservation measures for both human and site irrigation to establish a relatively closed system of harvesting rain water in subterranean cisterns and re-harvesting grey/black water though a living machine of botanical and biological nature. All systems and services will be completely integral to the design. The 80,000-square-foot architectonic form responds directly to the rich regional cues: an evolutionary process that has established, over millennia, a clear and appropriate identity found in the Middle East. Oppenheim Architecture + Design (OAD) is a full service architecture, interior design and planning firm with offices in Miami, New York, Los Angeles and Basel. Founded by Chad Oppenheim, OAD specializes in creating powerful and pragmatic solutions and has worldwide experience in hospitality, office, high-rise and single family residential, retail and mixed-use design, as well as the complete master planning and design of new cities and complete ecosystems.